This cheap, quick and easy soup is thick and hearty comfort food at its best and packed full of nutrition. 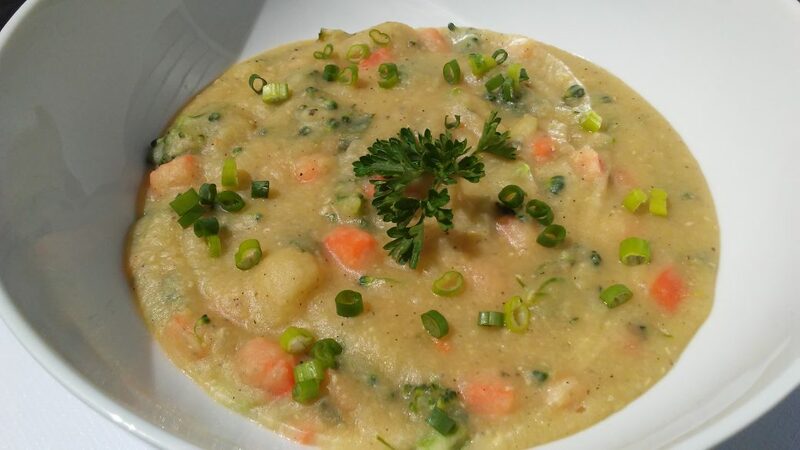 Lentils & potatoes provide a thick, rich soup without flours. Totally gluten free. The combination of nutritional yeast & white vinegar provides the subtle taste of cheddar cheese perfectly. Add the Lentils, potatoes, and vinegar to the 6 cups of broth and bring to a boil. Then simmer for 15 mins. Once the potatoes are fork tender use an emersion blender to lightly blend the mixture leaving some potatoes for texture. (you can also use a manual masher ) This should be fairly thick. Reduce heat to med-low. Add the carrots, broccoli, sage, thyme, and nutritional yeast.